Why you join; why you stay. Most golfers join The Tour because of the promise of great courses and fun competition. But Members renew year-after-year because of the people they meet, the friendships they form, and the laughter and (mis)adventures they share while playing this game we all love. Some members are course fanatics, intrigued by the design features of every hole. Some are equipment freaks with 13 drivers and 7 putters in their trunk. Others are just characters, period. Golf buddies, and beyond. 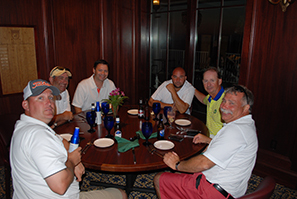 Tour friendships extend to gatherings off the course, including dinners and events in the offseason, such as bowling, Super Bowl parties, poker games, and more. Friends and guests are always welcome. A 2016 buddy trip to Bandon Dunes is being discussed. The Tour is a Member-driven club. Members lead club committees, including Local Rules, Handicaps, and Competition. Members influence management, course choice, and the overall club experience. The Tour culture: seriously relaxed. People respect the game, the rules, and pace of play, but they also love to kid each other. (They’ll tell you all about their own best shot, and their opponent’s worst shot.) The online Bulletin Board is very active: Members ask for travel advice, discuss that week’s PGA event, share when a certain course has better or worse conditions, sell equipment, or just post general rants and raves about all things golf, or otherwise. It’s often hilarious—but not always on purpose! Come try us. Join for the courses and the competition. You’ll come back for the club experience, year after year. Come aboard by joining The TOUR - you’ll love it. Check out this year's schedule.